Vintage Treasure in Martinborough: Souvenir Teaspoons - yes... I know, not so cool, but...wait! 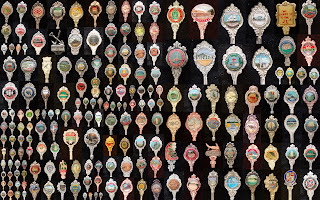 Teaspoons - collector teaspoons or souvenir teaspoons, you know the ones your Mother, Aunt or Gran had on racks from local towns, celebrating events and others from all over the World. They probably still have them on the wall...and like some of you I may have commented in a none too complimentary way about them. Well, it just so happens that I have to eat my unkind words - I now find myself looking at them a second time and they are really quite fun and versatile. 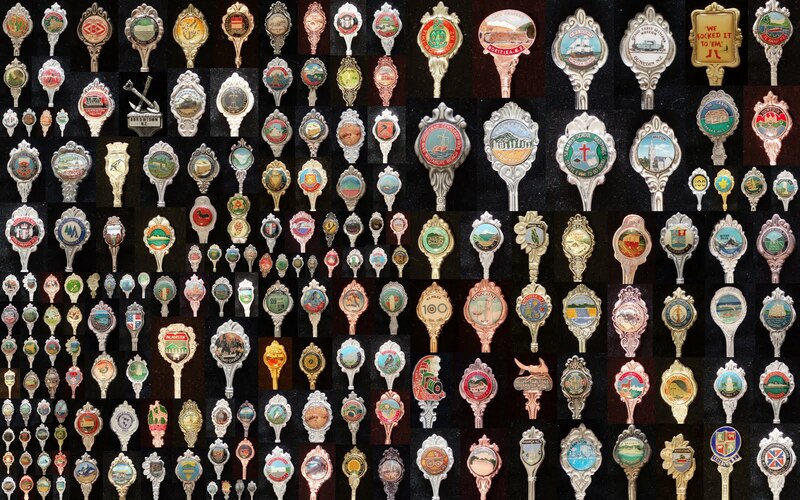 Who'd have thought that towns large and small would have souvenir teaspoons made to celebrate their existence (Johnsonville, Levin, Taupo, yes, even Martinborough). Or to celebrate an event (Americas Cup, Commonwealth Games, Marching Band Event). 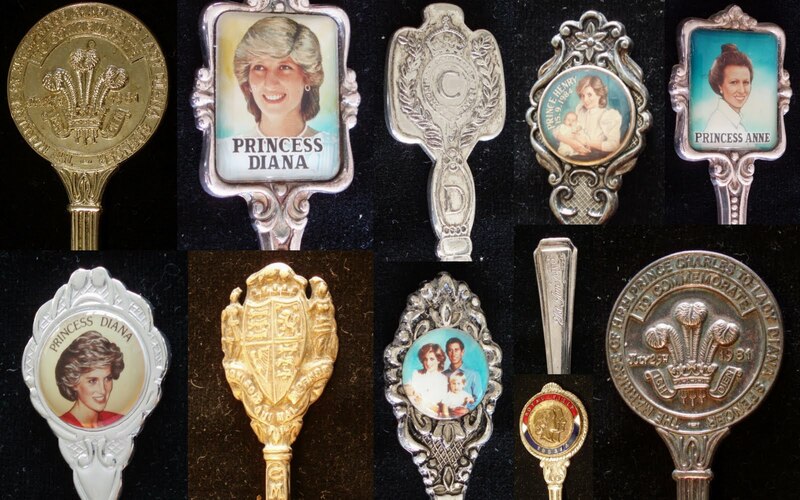 Any Royal Event called for a new spoon, visits, births, marriages and deaths! They recognise organisation anniversaries e.g. WDFFNZ - (Women's Division Federated Farmers New Zealand), GG - (Girl Guides), CWI - (Country Women's Institute). Birds, Animals, Special Occasions, Christmas, Signs of the Zodiac.... and more. Email if you are looking for a specific town organisation or event gertrudesnyder@vintagetreasure.co.nz and find out about mailing costs. 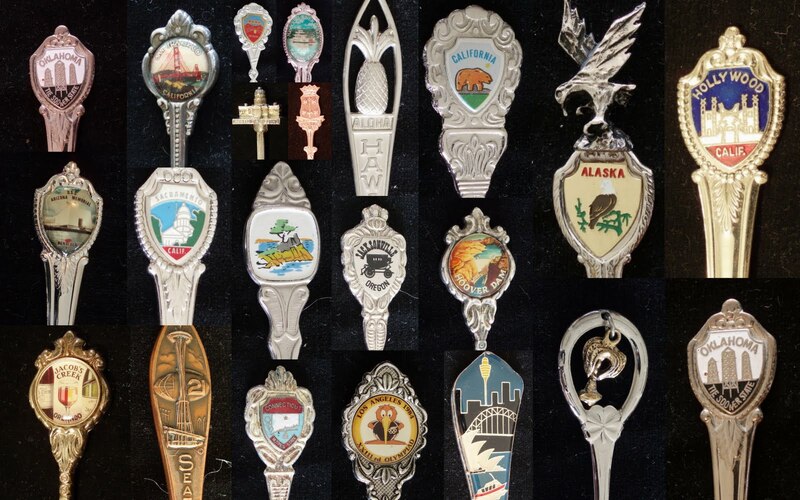 I have spoons from many various NZ towns and event and have doubles of a few if you are looking for a pair for making jewellery. Also see how they are being used for fabulous jewellery see http://www.quoil.co.nz/artists/phillipa_gee/ - just gorgeous! Buy some now for - gifts (what about adding into wedding favours, a real winner for those from out of town); collections - (start one, add to one); mementos (from locations visited or for special occasions); Home Stay and Bed and Breakfast talking points; crafts (add a ribbon and make a great gift ornament); jewellery making or even... for just stirring your cuppa - there is a spoon for every possible situation. I am Marion and live in Zandvoort Netherlands i am collecting teaspoons from Zandvoort. Thanks for reading my blog. I will keep a look out for Zandvoort for you. 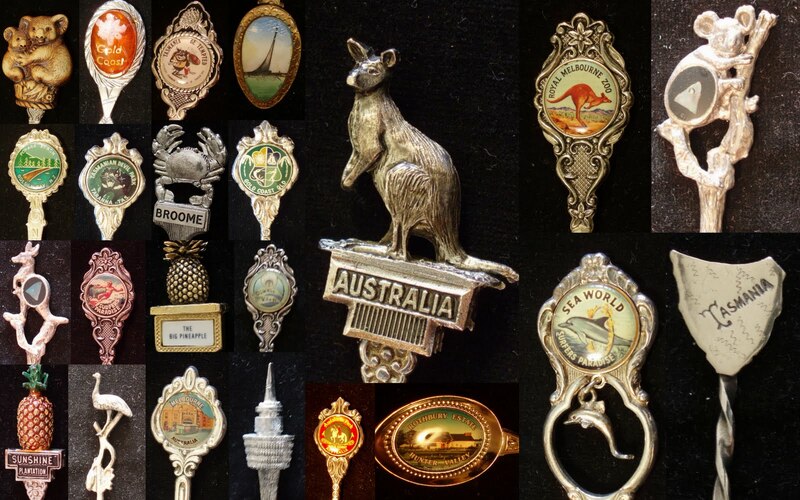 Could you email me at gertrudesnyder@vintagetreasure.co.nz and I can send you any photo's ones that I find. I am looking for a tea spoon with a teddy bear on top, do you have anything like this? Sorry for the delay in replying – I didn’t have one in the shop but somehow it rang a bell – and so searched the store but to no avail – sorry. If you send me an email and I come across one I’ll send you a photo. Hi, do you have a teaspoon with Tasmania on it? Thanks for your query - yes, I do have some Footrot Flats - send me an email and I can send you some photos. dgeisler@paradise.net.nz Thanks. Thanks for thinking of me - I do have quite a few spoons at the moment and so not buying any more at the moment. There are a few shops in Carterton, you should try too, they may be interested. Good Luck. Hi, I think that Mount Gambier is in South Australia, right? I would contact local second-hand dealers in your area and check if they are interested. You may also have access to an auction house that could take them to sell on your behalf. Good Luck, thanks. Hi there, are you still buying collectors spoons? Hi, Thanks for your comment - at the moment I have quite a few and so not really buying more at the moment. Thanks for asking. Hi do you know of any collectors that might be? No I don't I'm sorry - you could try your local women's clubs, or a sign at the library, maybe put an ad in the local paper? 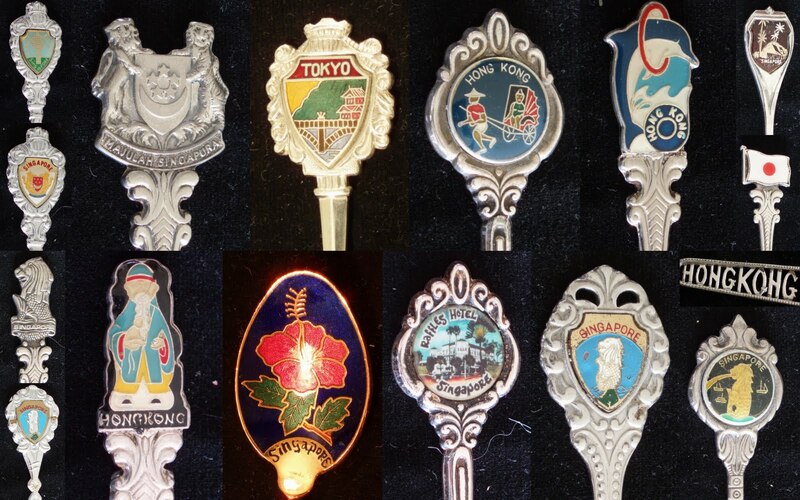 I did look up spoon collector clubs once but couldn't find any in my local area - you may be luckier. Good luck. Hi, do you know how to clean tarnished teaspoons? Thanks. Hi there, would you know anything about a silver plated teaspoon made in Dunsheath, Sheffield, with " Oak Pure Jams " inside an Oak leaf in the bowl? Regards Logan. Hello, This would seem to have been made as a promotion, souvenir or maybe give-away by the jam Company but I have no info on the company itself. Sounds pretty. Thanks. Hello. I have a carton full of teaspoons from all over the world including New Zealand. They have been collected over a period of a hundred years. Would you be interested in these? I can send further details if you are.